I think one of my favorite characters is Bernard because he is constantly conversing with inanimate objects. He believes everything from the tattoos on a woman’s arm to the cleaning supplies in the janitor’s closet, speak to him. He and Maxwell are roommates and they have many deep conversations about God. Maxwell does his best to share the message of God and through many wonderful thought provoking references, causes even the reader to feel the profound intensity of a God who truly loves his creation. My favorite of these conversations is where the other patients ask how a loving God could create them with all of their mental deficiencies. Maxwell’s explanation is fantastic and brought tears to my eyes. I would love to include it here but I feel it’s a powerful part of the story and would hate to spoil it for the reader. 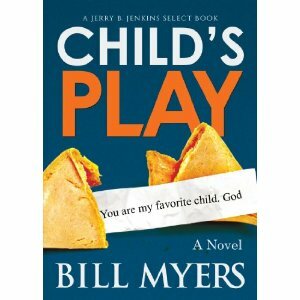 Overall, Child’s Play is a commanding story with a fun and exciting plot and lovable characters. I can’t wait to read the next book in the series. I give it five stars all the way around.